The key takeaway from an IEA SHC Solar Academy webinar held on 14 March 2018: There is still much room for cost cuts along the entire solar thermal value chain. The webinar was organised jointly by the IEA Solar Heating & Cooling Programme’s Task 54 and the International Solar Energy Society. The online seminar, titled Price Reduction of Solar Thermal Systems, was moderated by Sandrin Saile, Project Manager at Fraunhofer ISE, based in Germany. Its aim was to present the various ways in which the cost of solar thermal plants could be lowered to stop the bleeding on the market and give the technology a competitive edge over other thermal energy sources, such as biomass and heat pumps. In his presentation, Yoann Louvet, PhD student at the University of Kassel, Germany, said that Task 54 calculations of solar thermal costs were based on the LCOH, the levelised cost of heat, an indicator originating in the power sector. The LCOH is the ratio of total costs, i.e., investment and O&M expenses, of a specific system to the number of solar-based kilowatt-hours expected to be produced over its lifetime. The attached Task 54 fact sheet describes in detail what the LCOH calculation entails. 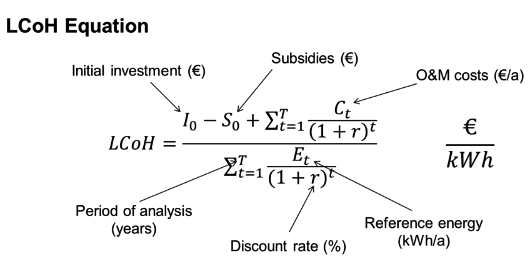 Equation for the levelised cost of heat, or LCOH. The reference energy value, or Et, represents the number of kilowatt-hours that a given reference system produces each year. Since Task 54 focuses on the residential market, one basic assumption was a discount rate of 0 %, as the solar thermal systems installed in this sector are usually paid in full when the purchase is made. It was also assumed that there would be no VAT to pay. To produce reliable estimates of cost reduction potential, Task 54 members chose 10 reference systems from 5 countries. The one in Germany was a 5 m² flat plate installation, including 300 litres of storage, for a single-family home. This sort of system has an LCOH of 13.9 EUR ct/kWh over a 20-year lifetime. The key message by Stephan Fischer from the German Institute of Thermodynamics and Thermal Engineering, University of Stuttgart, was that cost reduction potential can be found at every stage of the solar thermal value chain. Fischer talked about the vital role of standardisation, of which there was a lack in today’s solar thermal industry. He said that not only did collectors vary greatly in size, but that there was also a diverse range of mounting systems and temperature sensors might be attached to entirely different parts of an installation. Increasingly standardised system components, on the other hand, could reduce costs along the entire value chain (see table 1). Fischer’s estimate for the German reference system described above put the LCOH at 9.8 EUR ct/kWh, a cost reduction of about 30 % (see table 2). Michaela Meir, Head of R&D at Aventa AS, a company specialising in the manufacture of polymer collectors, explained how simplified production could help reduce costs. Polymer collectors had the potential for significant cost savings, as they required fewer steps to be produced. First, their extruded absorbers are cut to the right length. Then, the end caps are added to the absorber via infrared welding before the entire component is coated. She said that the collectors were also lighter and easier to handle, which lowered the cost of installation. Meir showed three real-world examples of medium-scale solar plants whose LCOH was between 3.5 and 9.9 EUR ct/kWh. Making increased use of solar thermal for multi-family property rather than for single-family buildings could also contribute to reducing costs, as François Veynandt, Researcher at Austrian Institute AEE INTEC, noted. Apart from being bigger, the systems could be integrated more easily with other technologies such as heat pumps or photovoltaic units, the latter in the form of PVT collectors. Likewise, they could activate a building’s thermal mass and offer the chance for centralised storage which provides space heating. Veynandt mentioned some sample calculations for solar thermal installations at multi-family buildings. In the case of Austria and France, they had resulted in an LCOH of 6 and 6.7 EUR ct/kWh compared to 12.5 and 10.5 EUR ct/kWh for a single-family building, which is a reduction of 52 % and 36 % respectively.